The NPC delegates will not be attending the event, according to its Speaker. It is not known whether Mr Sirisena is also cancelling his planned visit to Jaffna. However, none of the organisers have received any interim order against until Friday 10:00 p.m., the organisers who have urged the public to rally in front of the University of Jaffna at 9:00 a.m. to march towards Jaffna Hindu College. All public and private businesses were shutdown in all the five districts on Friday. People protested along the A9 road at Ki'linochchi in addition to the successful protest in Jaffna on Friday morning. 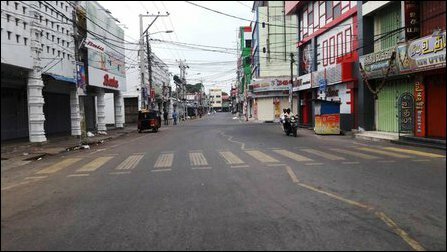 Tamil-speaking Muslims also took part in the protest and shut down their businesses in all the five districts. SL Governor Reginald Cooray was attempting to negotiate with the protesters through a former Tamil parliamentarian to avoid black flag protest on Saturday and to have a meeting with the visiting SL President instead. The organisers have completely rejected the deceptive offer. The former parliamentarian also received flak from the grassroots for entertaining the SL Governor while the people were protesting against Mr Cooray. 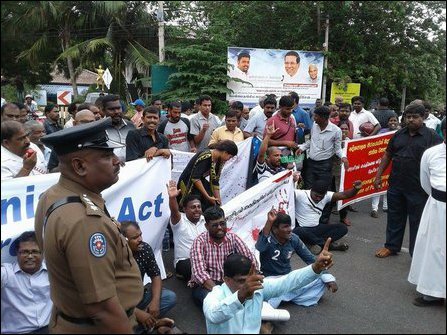 Around 400 protesters laid siege to SL Governor's secretariat in Jaffna and blocked the traffic along A9 Highway in the morning despite the presence of Sinhala police commandos. An attempt by SL Police commandos to assault the protesters was also confronted by the protesters and the police was forced to withdraw its plan of violent response. The SL State should honour the demands put forward by the hunger-striking Tamil political in Anuradhapura prison as a matter of urgency. Unconditional release of all Tamil political prisoners through a principle political decision. 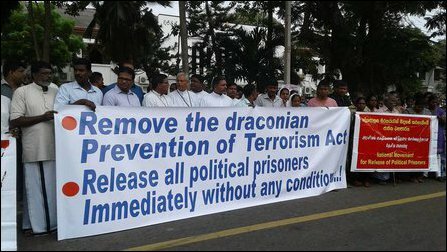 The parliamentarians claiming to represent Tamils should exert direct pressure on SL regime to secure the release of the political prisoners. 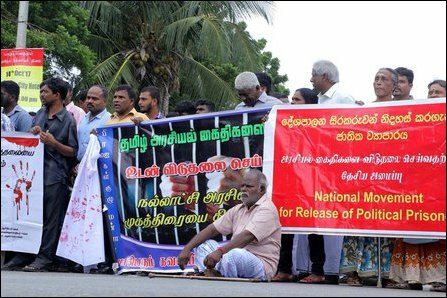 SL President Maithiripala Sirisena, scheduled to visit Jaffna on Saturday, should be conveyed the urgency of addressing the demands of the political prisoners.